Joseph came to Roane Co. from Ritchie Co. with his family in 1873 according to the Roane Co History book but the 1860 and the 1870 census says he was already in Roane Co. with his family at that time. The 1880 Census listed Joseph as being born in WV with his parents being from Virginia. Joseph and his parents were born in what was Virginia at that time. He might have been showing loyality to the new State. 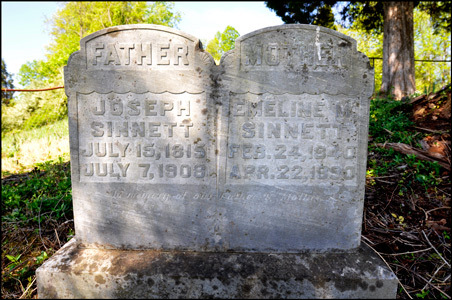 The Sinnett's were in Roane Co as early as 1857 but I have seen dates as early as 1837. But one thing that is clear, they owned a lot of land and bought and sold it very quickly for whatever reason. In 1837 the area was unsettled but for a few grist mills down by McKowns creek and Johnson creek, later to be the location of the village of Walton. Joseph was buried in the Humphrey Family cemetery located next to the old Sinnett farm outside of Walton, Roane Co. West Virginia on McKown's Creek. I'm not sure why it was called that but I have seen maps that call it the Ryan Cemetery and some books call it the Sinnett Cemetery. I am sure that the land was owned by Joseph Sinnett and that his wife was the first to be laid to rest there overlooking the farm. The Virginia Land Office Grants No.106, 1851-1852, Pg. 237 (Reel 172) listed Joseph Sinnett and William Boggs as being Granted 380 acres on the headwaters of Triplett's Run in Gilmer Co. The 1860 Federal Census listed Joseph and his wife and daughter as living in Roane Co. with the closest post office being in Roxalana. The value of his properity at the time was $500.00 and it also listed his wife as not being able to read or write. The 1870 Federal Census has Joseph listed as a farmer living in Walton, Roane Co. WV. with his wife and three children. The 1880 Federal Census listed as living with his wife and children in Walton Roane Co. West Virginia where he was listed as a farmer. It also listed Owen and Madison as twin sons.